All three major domestic equity averages marked their fourth weekly advance as investors remain upbeat on the economy despite a softer-than-expected preliminary reading of fourth quarter GDP. The 2.6% increase in 4Q GDP (down from 3.2% growth in the 3Q) was dampened primarily because the trade deficit widened, as imports increased at nearly twice the pace of U.S. exports. Wall Street overlooked the disappointment and instead focused on stronger consumer spending, up 3.8% last quarter - the highest quarterly increase in more than a year. Also signaling a solid economic footing going into the New Year, 4Q business investment expanded at the fastest pace in three years. Better-than-expected quarterly earnings continued to power equities higher, as the vast majority of companies offered strong profit outlooks for 2018, fueled in part by U.S. tax cuts. The S&P 500 has risen on 14 of the 18 trading sessions so far this year, the most up days in any January since 1989. For the week, the S&P 500 advanced +2.23%, the Dow Industrials gained +2.09% and the MSCI EAFE (developed international) jumped +1.50%. 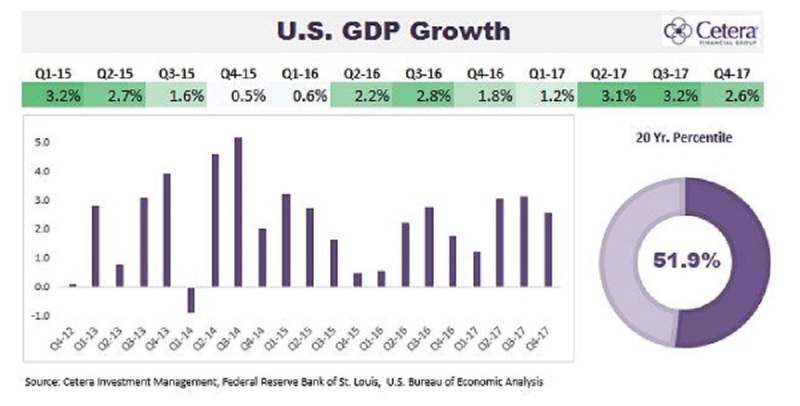 Chart 1 illustrates that U.S. GDP growth slowed in the fourth quarter to 2.6% annualized from 3.2% in the third quarter. Economists’ consensus expectation was for growth to remain over 3% in the last quarter of 2017. The decline was largely the result of a pickup in imports, a factor that subtracts from GDP growth, and a small decrease in inventories. Higher imports were driven by a surge in consumer spending, which accounts for roughly 70% of the U.S. economy. Consumer spending rose 3.8% in the fourth quarter, the highest level in three years. We expect spending to remain strong over the next few quarters because of pending tax cuts, rising home prices and record-high stock prices. As the U.S. Dollar is weakening, consumption growth may also contribute more to domestic GDP in the coming periods. The impact on GDP from imports and inventories is most likely temporary since there is a lot of volatility in these data points from quarter to quarter. For the year, GDP grew by 2.5% in 2017 and we anticipate that in 2018 growth may approach 3% for the first time since 2005 if consumer spending continues to strengthen.